Do you want to cut MP3 and other audio ? Do you want to merge MP3 songs ? Then this free application is for you. It can even split MP3 in parts or by time, It can edit MP3 files and shows their waveform and can mix MP3 or record MP3 files from various sources. 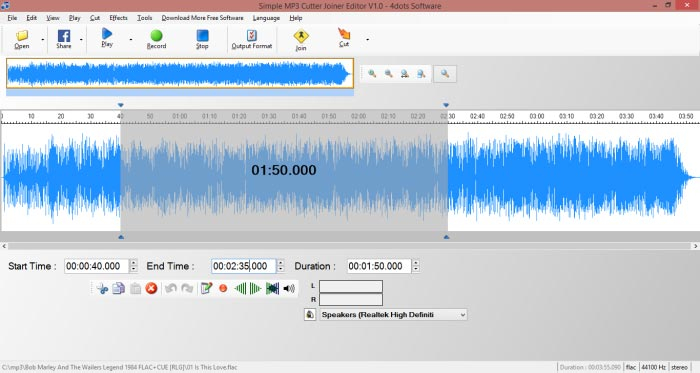 Simple MP3 Cutter Joiner Editor handles also other formats such as FLAC,M4A,WAV,AAC,OPUS,OGG,MP4,AVI,WMA,WMV e.t.c. With it you can rip CDs, apply audio effects such as fade in,fade out, tempo, noise reduction, normalize and more.